So we’re all getting older every day, and some of us have reached the age when our skin starts looking less young! Drinking my morning cup of broth! I’ve written about the benefits of bone broth here, here and here, and I’d like to share how bone broth helps you have glowing skin. I might sound like a broken record, but bone broth is truly a healing food! 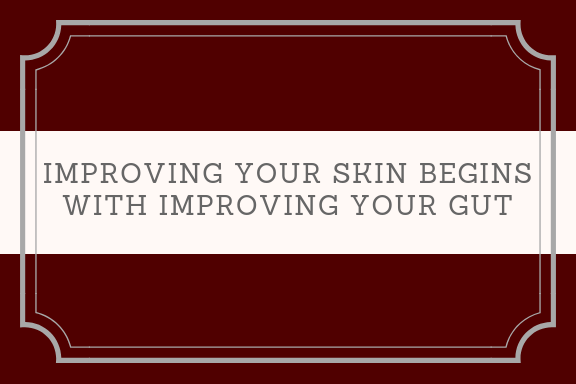 You see, the health of your skin is a reflection of the essential nutrients you’re eating (i.e. healthy fats, vitamins, minerals and antioxidants) together with how well your body is digesting and absorbing these nutrients. Today, many of us are having problems absorbing the nutrients we are eating because we don’t have a healthy gut lining (other wise known as leaky gut syndrome or intestinal permeability). What this means is that our intestinal lining has small holes which allows undigested food particles, bacteria and other substances to pass into our bloodstream where they don’t belong. Our bodies see these substances in our bloodstream as foreign invaders and this triggers our natural immune response (in skin: acne, rashes, hives, eczema and psoriasis). Frequent immune responses trigger inflammation throughout your body, which can cause or aggravate existing skin conditions. Bone broth contains two proteins that help heal and seal the gut lining: gelatin and collagen. Both help seal the small hoes in your gut lining, thereby preventing the substances from entering into your bloodstream and directly benefitting your skin! As mentioned earlier, bone broth contains collagen. Collagen is the most important nutrient for skin elasticity and is responsible for the plump, firm, youthful appearance of your skin. When your collagen begins to break down (as it does with age and toxin exposure), signs of premature aging such as fine lines and wrinkles begin to appear. Studies show that our bodies begin to produce less collagen once we hit the age of 25, which is why getting more collagen in your diet from foods like bone broth is important to promote skin elasticity and fight the signs of premature aging. Several essential vitamins and minerals are concentrated in bones, including zinc, which is an important mineral for fighting acne and maintaining clear skin. Bone broth contains glycosaminoglycans (GAGs), which are molecules found in the skin’s dermis, along with collagen and elastin. With a gel-like consistency, the role of GAGs is to fill the space between collagen and elastin, which helps keep the skin plump and supple. No need to use those hyaluronic acid injections as wrinkle fillers. Just drink bone broth! Good circulation is essential for bright, glowing skin, and the alkaline minerals bone broth provides encourage better oxygen flow throughout your body. Other trace minerals found in bone broth, such as iron and zinc, are also needed to promote wound healing, which can help reduce the appearance of red marks and scarring. With so many skin benefits, I should have been drinking broth all my adult life, but I didn’t. But, I have noticed that skin feels better since I started drinking broth daily, and I get less acne than I used to! I’m waiting for my wrinkles to go away as I drink more broth! In the meantime, I keep telling myself that each wrinkle (as well as gray hair) has been well earned!